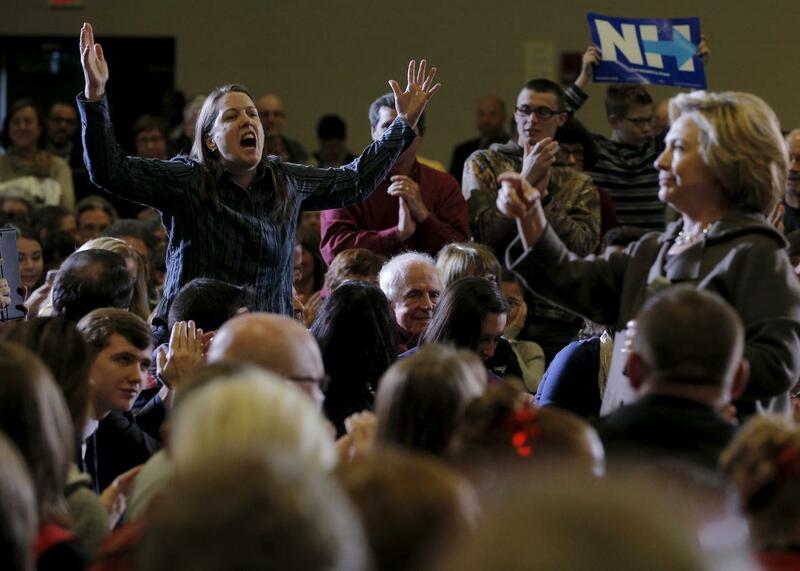 An audience member tries to interrupt Democratic presidential candidate Hillary Clinton as she takes a question at a campaign town hall meeting in Derry, New Hampshire on January 3, 2016. Hillary Clinton got a bit tired when a heckler repeatedly interrupted her during a town hall meeting in New Hampshire to try to ask about allegations surrounding Bill Clinton’s sexual history. “You are very rude, and I’m not going to ever call on you,” Clinton said after the third interruption, drawing a huge round of applause and even a standing ovation from many in the crowd. The person who repeatedly stood up to try to confront Clinton later identified herself as Republican State Rep. Katherine Prudhomme-O’Brien. She told reporters that she wanted to confront Clinton about claims that Bill Clinton sexually assaulted Juanita Broaddrick and Kathleen Willey. In a long Facebook post, Prudhomme-O’Brien wrote that “I have met Hillary 3 times before today and twice I have asked her if she believes Broaddrick.” But it is far from clear whether Clinton knew who she was at the event or if she could even hear the question. “I was a Democrat, but I became a Republican because of this, because of this stuff. Because of what I saw happen in the Clinton years, the hypocrisy of so-called women who fight for women,” Prudhomme-O’Brien told reporters after the event. Prudhomme-O’Brien’s outburst came one day before Bill Clinton is set to travel to New Hampshire to campaign for his wife. Republican frontrunner Donald Trump recently said Bill Clinton’s alleged sexual misconduct and extramarital affairs were “fair game.” But on Sunday, Sen. Bernie Sanders said Trump should focus on real issues instead. “We have more things to worry about than Bill Clinton’s sexual life,” Sanders said on ABC’s This Week.